Why people respond more favourably to pictures and remember them far more reliably, and for longer, than words. As well as how brands can go beyond the basics of personalization and create visually compelling brand expeirences across channels that are led by real-time data. 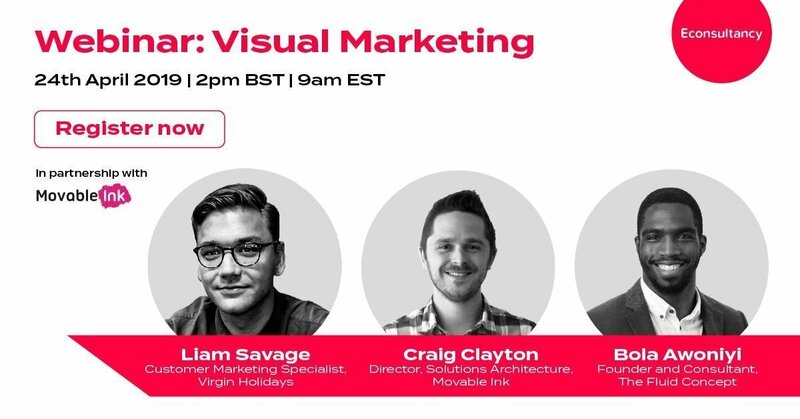 This webinar will be presented by Liam Savage, Customer Marketing Specialist at Virgin Holidays, Craig Clayton, Director of Solutions Architecture at Movable Ink and Bola Awoniyi, Founder and Consultant of The Fluid Concept. This entry was posted in Content Marketing on April 16, 2019 by Carine Alexis.